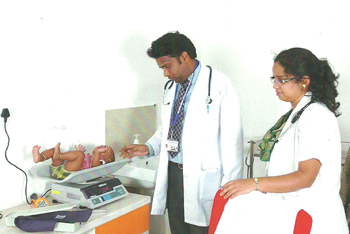 The College is affliated to the Rajiv Gandhi University of Health Sciences, Karnataka. The duration of the M.B.B.S course is four and half years (9 terms, each of 6 month duration) of academic Study and one year of internship. The course consists of 3 phases. Candidates are admitted to the Pre-Clinical Phase(Phase-I) of one year duration (2 terms) during which they study the subjects of Anatomy, Physiology & Biochemistry. At the end of Phase-1, they appear for the M.B.B.S Phase-I examination of the University. After successfully completing the Pre-Clinical course, the students enter the Para-Clinical Phase (Phase-II) of one & a half year duration(3 terms), during which they study Microbiology, Pharmacology, Pathology & Forensic Medicine. In this phase, the students also learn a part of the clinical subjects. They appear for the Phase-II university examinations at the end of the one and a half years. On successful completion of Phase-II, the students enter Phase-III which is of two years duration, having clinical subjects as part of the study. At the end of one year (2 terms), the students take the Phase-III(Part-1) examinations comprising the subjects E.N.T, Ophthalmology & Community Medicine. At the end of the next one year (the last 2 terms), the student answers the Phase-III (Part-2) examinations comprising the subjects Medicine, Surgery, Obstetrics & Gynaecology, Paediatrics & Orthopaedics. Clinical training in the Hospitals attached to the Institute will commence after the student successfully completes Phase-I & will continue till the end of the course.